The preamble contains, subtantially, the "professio fidei", the profession of faith [Rorate note 1] required of those who are put in charge of an ecclesiastical position. And it thus establishes a "religious submission of will and intellect" be given to the teachings that the Pope and the College of Bishops "enunciate when they exercise their authentic Magisterium", even if not proclaimed and defined in a dogmatic sense, as in the case of the greater part of the magisterial documents. The Holy See has mentioned repeatedly to her partners in the Society of Saint Pius X that signing the doctrinal preamble would not mean putting and end "to the legitimate discussion, study, and theological explanations of specific expressions or formulations present in the documents of the Second Vatican Council." The text of the preamble, with the modifications proposed by Fellay, and signed by him as Superior of the Society of Saint Pius X, will be presented to Benedict XVI, who, on the day following his 85th birthday and on the eve of the seventh anniversary of his election, receives a positive response from the Lefebvrists. A response long expected and desired by him, who, in the next few weeks, will put an end to the wound opened in 1988 with the illegitimate episcopal ordinations celebrated by Archbishop Marcel Lefebvre. The SSPX German District website posts the information relayed by the Swiss religious news agency KIPA/APIC, which merely reproduced the content of Tornielli's article translated by us above - and does not deny or alter in any way the information first reported by the Italian Vaticanist: "KIPA reports agreement" (in German). Paris: between Rome and the Society of Saint Pius X, "we are still in a stage of studies"
Paris/Menzingen, April 18, 2012 (Apic) - Between Rome and the Society of Saint Pius X, "we are still in a stage of studies," Father Alain Lorans, responsible for the communications of the Society of Saint Pius X (FSSPX / SSPX) in Paris declard on April 18 to Apic. Commenting upon the news published on the previous day by Vaticanist Andrea Tornielli on the website "Vatican Insider", the spokesman describes as "positive" the fact the Bishop Bernard Fellay, Superior General of the SSPX, has responded, earlier in the week, to the demands of clarification posed by Cardinal William Levada, Prefect of the Roman Congregation for the Doctrine of the Faith. But "not everything is already fixed," he underlines. Father Alain Lorans considers that Andrea Tornielli is perhaps speaking too prematurely, because Pope Benedict XVI and the Congregation for the Doctrine of the Faith still ought to examine the clarifications brought forth by Bp. Fellay regarding the doctrinal preamble submitted in September 2011. The Congregation for the Doctrine of the Faith (CDF) had asked the Society of Saint Pius X on March 16, 2012, to clarify its position on this doctrinal preamble on the occasion of a meeting in the Vatican with its Superior General. The Society had until April 15 to give a new response, which was done. Rorate note 2: actually first mentioned in an official ecclesial text in the very relevant n. 10 of the Decree on the Ministry and Life of Priests of the Second Vatican Council, Presbyterorum Ordinis: "Present norms of incardination and excardination should be so revised that, while this ancient institution still remains intact, they will better correspond to today's pastoral needs. Where a real apostolic spirit requires it, not only should a better distribution of priests be brought about but there should also be favored such particular pastoral works as are necessary in any region or nation anywhere on earth. To accomplish this purpose there should be set up international seminaries, special personal dioceses or prelatures (vicariates), and so forth, by means of which, according to their particular statutes and always saving the right of bishops, priests may be trained and incardinated for the good of the whole Church." I pray it is true. I guess I would really like to know what "religious submission of will and intellect" means exactly. Can one respectfully and thoughtfully disagree with what seems to be the current consensus of the Pope and bishops with respect to religious liberty, capital punishment, etc., while maintaining "religious submission of will and intellect"? "And when he had opened the seventh seal, there was silence in heaven, as it were for half an hour. " Apocalypse 8:1. While this leaves me very optimistic, I will hold off on the Te Deum and the Veuve until we hear something definitive from the Vatican and/or SSPX. Until then, we need to keep praying... now more than ever! But pray my children. God will hear you in a short time. My Son allows Himself to be moved by compassion. Now we must prepare for what will be a liberal onslaught against the Pope, against the Church. Now we must be prepared for liberal Priests and Bishops to defy the See of Peter, and the authority of the Magisterium. Now we must be prepared, now or in the coming future, for the schism to take place with the heretics in Austria and their global followers. Not that it would be a bad thing as a smaller more solid Church is what is required. Let us carry on building the walls of the Church to avoid wedding the age. Stregnthen the ramparts, defend the faith. Deo Gratias!!! The only thing that worries me is this "personal prelature". This is just my humble opinion but I think some sort of ordinariate would be better for the SSPX. I'm pretty sure that during the two years of doctrinal talks Bishop Fellay didn't want a prelature either. Yet I trust Bishop Fellay, so I'll wait and see the details before commenting on the alleged prelature that the Torinellians keep bringing up. I would like to mention something I have mentioned repeatedly here (though, as far as I recall, never as a post) and elsewhere: the name does not matter, as long as the divine constitution of the Church is respected, the Supreme Legislator (Peter) can do almost anything, use any names, combine different structures, create exceptions, particular characteristics, do anything: he can create a new structure out of others, call it an Apostolic Pineapple, and it is just fine, as long as he achieves his goal for that particular structure. So, please, please, let us stop with this name-obsession, that is not how the law works, and it is not how Canon Law works, as far as the legislator is concerned. We will return to this matter in a future post, thank you for your patience. Prayers answered, but keep them coming. I know that PKPT doesn't like the idea of a PP, and has given strong arguments against it, but I think a PP might not be too bad, assuming that it comes with a grandfather-clause that affirms all of SSPX current establishments where they are, requiring permission from the local ordinary only for new ones. As I see it, the problem with an ordinariate is that it would create the impression that the TLM is only for that ordinariate. (on the analogy that the anglican use is only for the anglican ordinariate). This would give bishops and others who don't like it an easy out "well, now if you want the TLM, go to the SSPX ordinariate" But we don't want to limit the TLM just to an ordinariate: we want it to be spread far and wide throughout the whole Roman rite. So in that sense I think the PP is a better option precisly because it does not build walls between the SSPX and the local ordinary. In any case, remember that permission from the local ordinary is no more and no less than that required for any other religious order, congregation or whatnot. I don't think SSPX can really ask for an exemption from that. What a great thing. I pray for this to be true. St. Michael the Archangel, protect our Church from the attacks of Satan. This is good news, now that the SSPX is in hopefully the ASSISI prayer meetings and other similar interfaith prayer services will end. Pope Benedict is rightly called God's Rottweiler. He is the Hound of Heaven. Thank God for Pope Benedict. Thank you Blessed Mother. I will withhold any celebations until everything is settled and done. The Evil One could still throw a spanner into all this. But for now I do say: Deo gratias! Fiat voluntas tua! Dear NC. You are a gem and your wisdom does not go unappreciated even as your commentary tends to make one forget that you are a convert rather than one who was Bornacatholic. "What - beyond the approval of the lukewarm and people pleasers - does the SSPX have to gain from this recognition?" The Society and Catholic souls have much to gain by their recognition. All can now be sure that their confessions and witnessed marriages are now valid. Also they offer Mass with no doubt of liciety and many who were sitting on the fence before will now assist at Society Mass's. This is pretty good for starters. I thank the Lord for this! Off-topic, but I can't help: in regards to the validity of confessions/marriages (SSPX), I wonder why NO Conservatives don't ask the same question about the Consecration during those Clown/Cowboy/Halloween/picnic/voodoo masses. Just curious. I knew this day would come from the time his holiness was elected pope, God bless him. I believe he wants this resolved before God calls him. He will be greatly persecuted for signing this agreement and we must support and pray for him. Long live Pope Benedict XVI. LAUDETUR IESUS CHRISTUS IN AETERNUM! Let us now wait for the confirmation and formalization of this! The Apostolic Pineapple of Antioch? Viva el Papa! Dios bendiga a Monseñor Fellay! Viva la Iglesia! So what exactly have they accepted? I agree that debating the semantics of the arrangement's designation is premature. 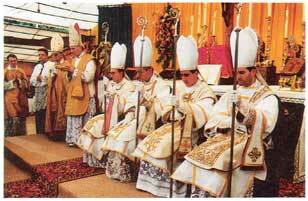 For me it all boils down to a single question: will the SSPX bishops be permitted to ordain new bishops? Without that authority the SSPX will be little more than a glorified FSSP. The part about the personal prelature is only Tornieli re-circulating his uncorrected speculations. Bishop Fellay has told us that Rome has offered more. That having been said, I pray to God that this is not some sick joke. Kyrie eleison. I did not suggest an ordinariate, although that would be better than a p.p. Please note that, at this point, Tornieli acknowledges that he is NOT reporting news but only adding speculation. His speculation is wrong because, a few weeks ago, Bishop Fellay said overtly that it wouldl not be a p.p. The best option would be personal diocese IF THIS IS CANONICALLY POSSIBLE given the problem of the condordats with France, Poland, Austria and Argentina. If not, an Apostolic Delegature will fit the bill. This is a new situation and needs a structure to impart the right degree of flexibility. The name does matter. The Church normally respects the character of her structures, and devises new structures when these are needed. Hence the personal prelature, the military ordinariate, the personal ordinariate, and the personal diocese made possible by Canon 374.2. Tornieli, notice, does NOT report a p.p. here. He merely speculates. Note the "probably": were he reporting news, we would not have that qualifier. I prefer to believe what Bishop Fellay has already said on this matter. Of course, if the Pope wants a p.p. and can exempt the S.S.P.X from Canons 297 and 294, that could work. But then it would be a p.p. in name only. Let us forget this issue for now and concentrate not on Tornieli's speculations but on his news. Concerning the canonical structure, don't forget who is the highest authority in Rome on Canon Law and would certainly be consulted for something like this, the great Cardinal Burke. If there is anyone to mediate a sticky canonical situation in defense of tradition, it is he. I like the idea of an Apostolic Pineapple. It has a very nice ring to it and puts an image in my mind of Bishop Fellay walking around in his beautifully baroque vestments with fruit on his head and a flowery lei around his neck. It will take DECADES to undo the damage of the last 50 years, but if the SSPX are back in fully, the war is won. The Holy Father, staring death and judgement in the face, and knowing what a catastrophe has occurred, has just booked his place in Heaven. OH MY GOD WHAT NEWS. Deo gratias! Obviously our blessed Lord has decreed the time is right. I am totally at peace about this development. All the prayers and rosaries offered for this intention have born fruit. It could not be otherwise. My prayers of thanks also go to Pope Benedict and Bishop Fellay, two men, although perhaps not always totally perfect in all things, who do love the Roman Catholic Church with all their hearts and have given their life in Her service. Truly this is a glorious moment in the life of the Church. Tradition will triumph in the end! This is the best news I had today and my heart rejoices!!! Now friends we all are aware that there will be a lot of work to do in the coming weeks and the coming months for the Holy See and for the SSPX and for all of us who are following this great event in the history of the Catholic Church, let not the work ahead take away the joy of what could have turn out to be something very sad and even tragic for the Catholic Church and the SSPX. The work ahead is immense, but let's take it one step at time, otherwise we will soon loose track of the Great Miracle that has happen and yes, I call it a miracle even though some who oppose the signing of the Preamble might disagree with me. God has willed it, otherwise the agreement between the Holy See and the FSSPX would not have happened. I have always been certain that Our Lord is in control of His Church, and Our Holy Father as Christ"s Vicar on earth is still guiding the Catholic Church. So please let us rejoice and give thanks for Our Lord has truly answer our prayers. Our Lady Help of Christians, thank you, for interceding to your Son for the Unity of His Church!!! I wish to assure the moderators that I do NOT intend to harp on the canonical structure issue on this joyous occasion, and I ask that they leave up what I have posted so far. The news here is not about structures as these will be decided in the weeks to come, and likely not until late June or July. The news here is about the Preamble, which, we are told, sets forth "principles and criteria" for interpreting Vatican II doctrine. If they have reached agreement on this, then all else might follow smoothly. But the news is not that there is an agreement, only that Bishop Fellay has signed something with minor modifications. We still need to see if those minor modifications will be acceptable to the Pope. Hold onto your socks and pray, pray, pray. Thanks, New Catholic, for so diligently keeping us all informed from European sources on this. This all sounds hopeful, more hopeful and definitive than anything over the last 24 years; I can't imagine Tornielli risking his credibility without having some assurance that this is for real; but the devil is in the details, so to speak, and he may not have all of those details perfectly right. We'll see how the Society and the Vatican react when they react. I also tire of the debates over canonical structures and nomenclature. Obviously, it won't fly unless the Society is content with it. I agree that the the bishops cannot be completely cut out of the picture, but I expect some sort of grandfathering arrangement will have to instituted for existing Society chapels. But we shall see. Meanwhile, there's no reason to stop praying. A legal note for P.K.T.P. The 1801 Concordate (in legal terms the Germinal An X Law) has been abolished in France in ... 1905. It remains in effect though ONLY in 3 "départements" (Alsace-Moselle) i.e. 2 dioceses (Metz and Strasbourg). So you can have as many personal dioceses as you want in France. Opus Dei had a statute tailored for her by John Paul II as a P.P. ; I guess it will be the same with this name or another like the Apostolic Pinapple for the Society. However a somewhat thorny letter by Msgr Pozzo (PCED) has been made public against the will of Fr Laguérie Superior general of IBP. It is pushing this ad experimentum institute erected in 2006 to embrace more of the "modern" Catholicism than he has done so far. It is carefully phrased but with a somewhat unfriendly tone. Even the "exclusive" use of VOM is at stake in Msgr Pozzo's letter which is the conclusion of a canonical visit. It smells like 1999-2000 crisis within FSSP. The letter is dated in the end of March 2012. Good news yesterday and now today! Thank you Dear Lord. How blessed we are with Pope Benedict XVI and the good men around him. Four groups of our Anglican brothers, bishops, priests and congregations have arrived home to the Church in Canada. Now our Pius X brothers have arrived back. Gosh, our numbers of (real) Catholics is growing. 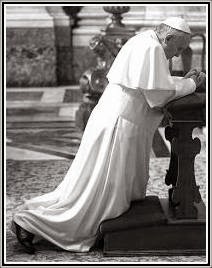 In humility, let us silently, prayerfully await the official statements from His Holiness wisely aware that the Divine bestowal of the Graces of leadership will flow to the Vicar of Christ and his faithful son, H.E. Bishop Fellay through Our Lady of Good Counsel's Immaculate Heart and Hands. . .not through Mr. Tornielli nor any others. "For who hath known the mind of the Lord? Or who hath been His counsellor?. . .For of Him, and by Him, and in Him, are all things: to Him be glory for ever. Amen." Romans 11:34. "Veni Sancte Spiritus" through Our Lady and St. Joseph's intercession. Whooo Hooo! I'm all smiles and elation but I'm waiting til it's final. The devil's not going to give up. I love our Papa and I love Bishop Fellay! Now whilst I trust Bp Fellay, these will be the deal breakers, if the answer to any of these is no or if the religious orders get sold off down the stream I think we could see a major split in the society with the majority not 'joining rome'. Ultimately though I trust the document does not require these things and is entirely reasonable. While many of the priests of the SSPX will help in the Restoration of the Church to Tradition, I fear that some of them, and some of their bishops, as well as many of the laypeople associated with them have the potential to lead souls astray through their sedevacantist views. You can see how negative the reaction to this news is on Angelqueen. Let us also pray for the SSPX, that their heresies may be dispelled by the Light of Jesus Christ as they come into His holy Church. "A prediction: Many, many souls from Novus Ordo parishes will flock to the SSPX." A massive amount of "Latin" Church Catholics don't want any part of Masses in Latin. With few exceptions, bishops and priests in the "Latin" Church don't see the need for Latin Masses. That is why virtually each parish in the "Latin" Church is vernacular-only. At best, we may move to praying the "Our Father" or "Lamb of God" in Latin. Thankyou Our Lady of the Rosary. Excellent comments from New Catholic at 21.31 and Giddy Up at 21.40. On the Econe Seminary website, you will see from the "Geographical Location" link, that the Seminary is situated in the Valais Canton (Switzerland) not far from the main town of Sion. I guess we will all finally understand the revelations in Scripture on the Last Day/Judgement. When I was much younger I sometimes had the priviledge of attending Mass held by a very holy Jesuit. Father always said we were in the Last Times. Thank you for reading through all the Biblical quotes. While we are giddy and delirious, this does mean that Bishop Fellay has apparently gone back on his word, for what he said repeatedly is that no agreement would be signed and no structure sought until there was agreement on the doctrinal disputes. What we apparently have here is only agreement on the "principles and criteria" for interpreting doctrine--not the same thing at all. So, if this news is true, it could bring serious trouble. Will the other three bishops accept it? Will this go down as the day of the Apostolic Pineapple? (See what you have done NC!) Let's just hope it doesn't turn into an Apostolic Lemon. Wanting to believe that this will be the answer to our prayers... but my heart is trembling. Lucas, most of your worries are not real problems. They will be allowed to criticise but in a constructive way, and 'avoiding all polemics'. Their affiliated religious orders can remain affliliated by special agreements in statutes: not a problem. A larger problem is that there is so far no agreement on doctrinal disputes per se. If the Society has accepted the principles and criteria and recognised the Magisterium of the Popes, this must be an act of Faith and of trust, because Rome, we might worry, could decide against Tradition. Or could she? Would God allow it? I see problems in that area. Santo Subito B16 he has done more in 7 years than JPII did in a lifetime. Though I am sure in some ways that may be unfair. 1. Who will be in charge of the SSPX once the Bishops are integrated in to the full life of the Church? 2. Should we expect Bishop Fellay to get a red hat, and if so where in Rome will he be working. I say the CDF. 3. What sees will the other two Bishops of the SSPX be given and what nationality are they? 4. Bishop Williamson, where does he fit? Perkins, we shouldn't go back and parse every word. This is politics, give and take, push and pull -- compromise. The SSPX, if the reports are true, is clearly moving out of this on top. Let's just rejoice and pray the majority moves forward giving thanks and praise to God. "The response of the Society of Saint Pius X has arrived in the Vatican and it is positive: according to the informal information gathered by Vatican Insider, Bishop Bernard Fellay would have signed the doctrinal preamble"
In other words Mr Tornielli is speculating again. I'll wait for a statement from Rome. The neo-Catholics have already started to throw a temper tantrum on this news by twisting and fabricating (if not out right lying) about the SSPX. this is only the beginning folks. The neo-Catholics are not happy...Deo Gratias! In amongst all the excitement, I agree - we need to keep praying. It isn't over yet and nothing is official. I want to be happy, but after 30+ years of trial, I want to be certain. Please keep things in perspective. The war was won on the original Easter. ALA the St. Benedict Center, Rome and Econe can agree to disagree! Opus Dei is not the only personal prelature in the Church. I am active duty US Army, and the Archdiocese of the Military Services (AMS) is also a personal prelature. It works fine when local Bishops are brotherly and supportive (and most are, regardless what country we find ourselves in). I never thought I would live to see this day! I have prayed for this since the early 1970s. Thank You, Lord Jesus. Now we will let time do the rest!!! No, Catholic Johnny, Military Ordinariates are NOT personal prelatures. They fall under a different statute from 1986. Must we wade through all this again and again? The Prelature of the Holy Cross is the only personal prelature in the Church. Military Ordinariates are quasi-territorial and quasi-personal structures. They have jurisdiction over all faithful on military bases and over military personnel alone (not civilians who work on bases) off base. Let's move on. The Anglican personal ordinariates are also not the same animal as the military ordinariates. There are also territorial ordinariates for mixed Eastern Catholic churches in Western areas, and then the Armenians, my favourite Catholics, have a special Armenian territorial ordinariate which is like a junior diocese. Mr. Cattaneo, are you serious? Bishop Fellay will remain superior-general ahe will likely become the personal bishop of a personal diocese (not p.p. ), a structure closest to the Campos precedent but extending everywhere. Tissier and Galarretta, should they play along with this, will become titular and auxiliary bishops in the structure. Nobody in the S.S.P.X is getting a red hat, unless a four year-old confers it for a birthday party. "if the SSPX are back in fully, the war is won"
I can appreciate what is happening with the SSPX, but how does the gap between where we are and where we want to be get erased, short of an apocalyptic chastisement? PKTP, are you a Bishop? It was my AMS Bishop who explained this to me. I hope the Pope accepts this supposed agreement ! My brothers and sisters, I welcome you all back (though you were never fully away)! I am a seminarian, a so called NO Conservative by some, at the Pontifical College Josephinum. My home is in not only the Ordinary Form, but also in the Extraordinary Form. Brethren, since I found out about this situation a year ago, I have been praying unceasingly for this day. I have offered many a Communion, Rosary, and Chaplets of Divine Mercy for this day, and let it never be said that the power of prayer has been lost. Again, welcome back, for as Our Lord has said, "Ask and you shall receive, seek and you shall find, knock and the door shall be opened to you." May the Almighty God, who said the Hell shall not overcome His Church, send His Holy Spirit to guide our Holy Father now and always. "...but how does the gap between where we are and where we want to be get erased, short of an apocalyptic chastisement?" Through prayer and personal conversion, Sue. "Let us also pray for the SSPX, that their heresies may be dispelled by the Light of Jesus Christ as they come into His holy Church." And Hugh just had to spoil it all! Come on Hugh, the SSPX are not heretics! I will be praying so much that once under canonical jurisdiction, they will not fold under pressure. Thank You JESUS! I do hope this is true! The Church needs UNITY! We understand the problem and your concerns. I don't know of any other trad group that is as devoted to our Lady of Fatima as is the SSPX. Her Immaculate Heart will be their refuge and their strength, just as It was for Sr. Lucia who must have undergone a virtual martyrdom behind those walls. First, thanks to Rorate Caeli for giving us this news in a timely fashion. Second, a huge thank you to Bishop Fellay for demonstrating his fundamental Roman Catholicism and uniting with the Pope. The difference between Bp. Fellay and Bishop Williamson (who has many good points and much courage), is that Bishop Williamson never completely converted. He is still an Anglican with Anglican sensibilities when it comes to Rome, so it is his heritage to resist the pope. Fellay demonstrates his Catholic heritage with this intrepid assent to the pope’s generous offer, which will cause Bp. Fellay to be vilified by schismatics in his own ranks. So be it. He has done the right thing. Do you any of you know Bishop Williamson? Have you ever met the man lest spoken to him as a Catholic would a priest? How in Hades can you claim to know 'what his problem is'? Stop the veiled or not-so-veiled ad hominem attacks. God Bless you, KP at 01:49. All best wishes for your studies and future ordination. Please Our Blessed Lord, this is true. If so, the tide is finally turning. As others have mentioned, I too cry tears of joy! The tide is turning. There is much labor ahead. But the tide has turned. Just as the darkness seems to envelop us all, a sign from our Dear Lord that Faith and Hope endure. Please SSPX come to the diocese of Saint Petersburg, Florida. This is the most densely populated county south of New Jersey. It's a beautiful place, with kind people at the Novus Ordo masses but it's in desperate need of one or several TLM's. We have just a couple of TLM's on Sunday and one consecration is done using a wooden alter. I know there are a lot of needy places around the country but this place definitely needs a shot of tradition and soon. It took a German to wreck havoc in the world (Hitler) and it seems like justice demands another German (now the Pope) to bring order and sanity back into the world. At long last! Deo gratias. Thank you Holy Father for your strength and thank you Bishop Fellay for your wisdom. Prayers will continue. They are still greatly needed. I am so happy to see this happen in my lifetime. I imagine that the Bishop as well as the Holy Father feel a sense of relief as well as hope for the future. This Pontificate will long be remembered for setting many things right in the Church.. Thank you Bp. Fellay for taking this opportunity. I agree, Santo Subito B16. He has pursued this goal for 7 years. Now Benedict's pontificate will be an amazing success. What joy. I am also glad for Long-Skirts for now her children will be in too. I look forward to attending an SSPX Mass. Thanks also to New Catholic. 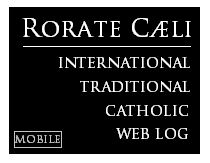 Rorate Celi must have helped a bit. Thanks also to the FSSP and Institute of Christ the King. They have sood stoically in the sidelines throughout these negotiations without a peep. I do hope the new structure will include them too. It is most surprising that the FSSP does not have a Bishop. The Bishops will be much more willing to allow the TLM now. The full effect of Summorum Pontificum will be felt. The onslaught of the Modernists will be amazing. Be prepared for vitriolic attacks in the press. In fact, it is surprising they did not start before this arrangement was reached. Deo gratias! I will continue my prayers that full regularization happen. A house divided cannot stand and our culture in in close to full on attack. I am really going to try to be good and not enjoy the teeth nashing of the "progressive" Catholics wailing. I know that there is much prayer and healing that must happen. To have the full and active witness of those who have held onto and retained our patrimony of the TLM and traditional sacraments and the role of church militant will do much to strengthen us of the church militant. In Thee, O Lord, have I hoped; and that hope shall never be in vain. I hope you are right, but this avoiding all polemic nonsense is wrong. Firstly polemic is often good and secondly they will either be allowed to keep their views or not, either the new mass is licit to attend or its always sinful to attend it for example. Also will their religious orders be recognised as 'reformed orders' or reintegrated into their mother orders? Those of you who are attacking Bp Williamson without even knowing what is going on need to stop your calumnies, anyone who doesn't think he ever 'fully converted' is simply ignorant. He is a very intelligent and entirely catholic bishop who I have had the pleasure to hear and see preach on several occasions. As I said earlier it is good to rejoice!!! I believe we will have a positve outcome, nonetheless we need to PRAY TO OUR LADY AND THE HOLY ANGELS AND SAINTS OUR HOLY FATHER NEEDS OUR SUPPORT AND SO DOES THE FSSPX ESPECIALLY BISHOP FELLAY AND THOSE WHO ARE WILLING TO COME ABOARD I PRAY ALL OF THEM. LET US PRAY THE PRAYER TO ST. MICHAEL THE ARCHANGEL, PROTECTION FROM THE ENEMY IS MUCH NEEDED IN THIS IMPORTANT MOMENT IN THE CHURCH. qui ad perditionem animarum pervagantur in mundo, divina virtute, in infernum detrude. Our Holy Father, God bless him, does believe in Collegiality. And there are sound prudential reasons for it, too; this is not a world, and in fact it never was a world, in which a Pope could afford to ignore his Venerable Brethren. So he may very well wish to address a letter to his brother bishops explaining a new situation. He has done this before, hasn't he? So I suspect that the Vatican will not create a situation in which the world-wide episcopate first hears the Good News in a Lombardi press release. I never said that avoiding all polemics was good. I merely commented that this formula is now standard. On the matter of the religious orders, it may be that they not be re-integrated but are simply allowed by special permission to continue to use the names of those orders. The Pope can do anything in the positive Canon Law he deems to be needful. I am more concerned that accepting the Doctrinal Preamble might have implications which will only become apparent some years from now. Your negative comments about Bishop Williamson are not justified. If you wish to criticise Bsp. W., by all means do so, but do so fairly. It is not fair to say that he never completely converted from Anglicanism. Moreover, don't assume that W. will be the main or only Society opponent of any coming arrangement. I would be more worried about how Tissier reacts to all of this. The tide is turning indeed. Deo gratias. As a European, allow me a Eurocentric comment also: this tide will - in the long run - flush out a lot of debris in these here lands. This tide will swell around the theological ivory towers and wash out the many Sarumans: all those protestants, those schismatics, those heretics that call themselves "Catholic" theologians, hiding up there like the fallen wizard of Isengard.. This tide will flood the tax-funded and comfortable, luke-warm and "ecumenical" administrative paralysis that covers the Church like mildew across Germany and many other countries. Wash us clean Lord! Wash away the musty paralysis, the silken web of lies of the many Wormtongues and their ilk, be they of the cloth or not. All those brothers and sisters, the prelates, priests and their "pastoral specialists" who are comfortably and defiantly living lives as Secular Humanists, and thus fail to catechise the Catholics, defend the Faith and convert the Non-Catholics around them: may this tide wash us of our sinfulness Lord, let all of us be washed clean. Let us repent, pray and fast. The battle horns are about to sound yet again. The "Anglican" form of "collegiality" (which is your former heritage) is not the same as the traditional Roman Catholic concept of collegiality. We've had enough of post-conciliar collegiality (the altar upon which the exercise of papal primacy has been virtually sacrificed). So excuse us if very few of us on this board are anxious regarding your concern. Thank you for that information regarding recent developments vis-a-vis Msgr. Pozzo and the IBP. It's another sobering reminder that the Evil One is not about to just roll over and abandon the battlefield. Pozzo is a neo-con, pure and simple. Neo-cons do not either like or trust us and will not stop trying to "bring us up-to-date." The real battle will begin upon the death of the present Pontiff. Vatican bureaucrats like Pozzo will be working overtime to "modify" any agreement made between the SSPX and Pope Benedict. Well I should hope its more than merely the 'name', they need to have the rights of those orders as well, that is really be these orders. And we will see, I am sure Bp Fellay knows what he is doing. It is quite a surprise to find such an abundance of differing reactions to the “Report from Rome” (where have I heard that before ?) which is simply another speculation from Signor Tornelli, it could be true, it could be false. Me, I wouldn’t dream of expressing my own viewpoint on such flimsy “evidence”. It’s amusing that reactions range from countless cries of “Jubilate !” to that of Hugh Embriaco who “prays the heresies (of SSPX) will be dispelled by the Light of Jesus Christ as they come into His holy Church”. I don’t like to make personal attacks, so, I won’t. Bartholomew: I wasn't recommending - or even opposing - any form, concept, or interpretation of collegiality. I was simply suggesting ...given his previous form ... how the Sovereign Pontiff might play things. My point was that I wouldn't be surprised if the definitive News were delayed a little longer than we all would love it to be. If I'm wrong, I shall be very happy to be wrong. I apologize, Father. I missed completely the point you were making. If true, this would be an intensification of the test -- a turn of the screw -- not its end. Look around your diocese a year or two from now, and wonder at how little has changed!! Hail Mary full of Grace the Lord is with thee. Thank you Virgin Mary for answering all those rosaries. Praise be to God! Obviously there is a long way to go before anything is "official," but this certainly seems like a big step in the right direction. To all the posters who complain that little will change in the average diocese because of this: yes, you are probably right. The crisis we are in didn't begin overnight and it certainly won't be solved overnight. The Church thinks in centuries, and 100 years from now I hope Catholics look back on the SSPX/Rome agreement as a turning point. Is some (reasonable) act of public penance imposed on them. Sure! The SSPX is definitely guilty of defending Tradition for over forty years against all sorts of abuses, calumnies, 'excommunications' and so on. I wonder, what 'fruits of renewal' you see around in your NO parish. Communion in the hand? Perhaps, it's the altar girls and the EMC's. If we're going to start getting into public penance, I think SSPX is going to be toward the back of the line on that one. Even the Holy See, arguably, belongs further up front. "....Also it would be fitting if there is some (reasonable) act of public penance imposed on them." It's unlikely that the Holy Father, kindly soul that he is, would require a public penance. Those SSPX who will go with the Society and reconcile with Rome will have much to suffer from their SSPX brethren (and the sedevacantists) who will not join them in reconciling. Surely those who reconcile can offer this up as penance, if they choose, either for themselves, or for the good of the whole Church. And those liberals and others who dislike or fear tradition, or the TLM, will also attack those who reconcile. We humans are not so merciful as our dear Lord is. But if the suffering is borne patiently out of love for our Lord, who suffered much for us, then there is good that can come of it. It will be fitting when the fruits--and nuts!--of the "Renewal" are doing public penance. "The crisis we are in didn't begin overnight and it certainly won't be solved overnight. The Church thinks in centuries, and 100 years from now I hope Catholics look back on the SSPX/Rome agreement as a turning point"
A year or two from now, neo-Caths subservient to the theology of the nouvelle closet-protestants who dominate the Church will still be in place, and the trad opposition which rallied around the SSPX will be digested, eliminated, and forgotten. Centuries from now, Catholics will not remember any of this. They will be too busy with interfaith ballroom dancing and "Catholic Idol" charismatic talent contests. Benedictus qui venit in nomine Domini . This news frightens me because I've heard that after the Transalpine Redemptorists regularized, they regretted it. Dear Ralph R-D. Fantastic. About the future it is too early to tell but right this minute, that was one helluva funny post. I cannot understand the joy here. Are there any guarantees they will not be absorbed into the loss of what they have preserved for so many years? Why did Archbishop Lefebvre dedicate the last 21 years of his life to preserve Holy Mother Church? Many questions must be addressed here, before one breaks out the party bags. We need to know what we are celebrating and if we ought. I'll wait for more information first. the Society of Saint Pius X. Is some (reasonable) act of public penance imposed on them." Public acts of penance? For what? Keeping the faith alive? We've all been doing our penance for over 40 years. I do mine every Sunday when I sith through the inane aspects of the NO mass because theire is no TLM around here. And who is going to do the public penance for the long-standing injustice and the abuses documented in the following article? rite of Mass to any priest except above 75 years old and only with one servant. I remember Fr Patrick Fox in Australia back in 1975 brandishing from his pulpit on his 50th anniversary of priesthood a newspaper with the big title: “Latin Mass Forbidden.” Thanks be to God that he continued to say it. I remember a Dominican priest in my city (Rouen, France) telling us after Mass at that time, “you need to know that ‘they’ forbid you to come to my mass.” But, he concluded: “let them tell that to you themselves!” He did not forbid us to come, Deo gratias. The same bishops let proliferate abuses without restriction: communion in the hand was a big one, well understood at that time, but now it has become so common that many no longer appreciate the scandal to the faith of many that it caused – and is still causing (most faithful at the time were unaware of the grievous moral abuses which many bishops did not correct as they should have); thus when such bishops used their authority to cast out priests faithful to the Mass of all times, already at that time there was no need to be a doctor of the law to understand that there was a problem with authority: in the words of St Paul, authority was not used “unto edification, but unto destruction.” It was a complete abuse of authority. How could it be ratified by God? I wonder what Our Lord would have said if the Sanhedrin had suggested that He do public penance for His perceived disobedience to their lawful authority??? Perhaps, "I do this for thy sake. The preservation of Catholic traditions is what the SSPX is fundamentally about. Look how we have grown over the last 40 years. The TLM is wanted and desperately needed. Preserving Catholic heritage is a good thing, the Mass for ALL TIMES as prescribed by the Council of Trent is still intact and it continues to grow. So our penance for the last 40 years has been to preserve what our fathers handed down to us as the Most Perfect Prayer. We do this out of respect for our fore-fathers, for Our Lord and Heavenly Father, for His Holy Catholic Church... we do this for thee. Mike, you, in your enthusism, say that, "Many souls from the Novus Ordo will flock to the SSPX." You know something, you are right, and you know what else, the SSPX will become Novus Ordo. I was the principlal lay founder of the first traditional Catholic parish in the world in union with Rome, St. Joseph's, in Richmond, VA, in 1991. (See the spring issue of the 1992 Latin Mass magazine with its cover story of St. Joseph's).Started out very traditional. Then there was an influx of Novus Ordo "Catholics." Within a very few years, it had become simply a Novus Ordo parish where the Tridentine Mass was offered.In all other respects it was and is one with the New Church. Today it is served by the Fraternity of St. Peter, where the Bishop of Richmond will soon administer his Novus Ordo confirmation to parishioners. What is being hailed on this site as a great blessing will prove in time to be the very opposite. Bill, The Transalpine Redemptorists are under the local bishop and are kept in their place, this wouldn't be the case with the SSPX who would be independent of local bishops. Michael, I'm sorry to hear about St. Joseph's but don't you think that the cause of all this is because the FSSP are under diocesan bishops? As has been said already, the SSPX would not be under the control of these bishops and so things would different. You all think the SSPX - reconciled with Rome - will have that large of an effect on the neo-cons of the Church? Keep dreaming. Many of us don't want the kool-aid you're all selling. Like many of you I am excited that our separated brothers in the SSPX are coming away from their exile and back into union with the pope, but I hesitate to rejoice fully. The SSPX has been separated for so long that their isolation has caused a break between themselves and the rest of humanity. Christ said that Christians must be the salt and leaven of the world, and that means that you must be in the world to do this. Leaven does nothing to the flour unless it is mixed in, likewise is it difficult for Christians to be the tools of Christ in guiding the world to him from a bubble. Yes, the SSPX might come into union with the Church on paper, but the hearts of these good people need to be unified with the Church as well. Will they recognize the validity of the Ordinary Form? Will they return to the idea that they must attend mass every Sunday even if there is no Extraordinary Form mass to attend and a plethora of at least valid OF masses to attend? Will they unite with us to help the OF become more universally beautiful, or are they going to continue to leave the fight to the rest of us? Yes, I have hope, but the fight is long and hard and I am tired of fighting both sides, it would be nice to have them at our back instead of having to fight both the extremes. Yes, I want them to come back into union, but I want them to do so with the joy of charity and not the bitterness of duty. You talk of "Novus Ordo People" like they are a plague. They are nothing of the kind. These people are Catholics just like you or I. Some people who attend the Ordinary Form have less education in the traditions of the Church than we have been blessed to have, and so these people deserve our help, they deserve our guidance, and they do not deserve our scorn. I am a student at a small liberal arts college where at least 90% of the students grew up in normal OF parishes, there is even a girl who used to do liturgical dance. But about 70% of these OF students have come, through the 4 years they spend at this college, to love the EF and have gone back home to share this love with their parents and friends. The reason they have formed this love is because those of us who grew up with the EF have met them with love. We did not scorn their ignorance, we did not condemn them for things that they did in the past that we saw as wrong, they did not do them out of malice, they did them out of ignorance. You say that your parish has been taken over by the OF, well, now all those people who go to the OF have the opportunity to attend the EF at times. If they were separated by parishes then those people might never have the chance to see the beauty of the EF, but now they do. Also, what if the EF people did not separate themselves, but rather took part in the choir for the OF masses and slowly introduced Latin and chant into the OF masses? When those OF people wanted to attend an EF mass, they would not feel as alien and they might even be led to prefer the beauty of the EF to the simplicity of the OF. But how can this happen if those who know what beauty is refuse to share it and refuse to help those who do not know. How can you expect people to see beauty in something so foreign to them? People must be taught and they cannot be taught to love what the lovers selfishly keep for themselves. PS: The regular OF parish where my college is, has centered the tabernacle, they now have mostly little boys for alter servers, they have Latin and chant at every mass, the priest has begun to study his faith more and the results can be clearly seen in his sermons, there are plans to build a high altar, etc... these are all changes that have been caused by the love of the college community for the parish. Scorn and fear cannot accomplish the beauty that love, understanding, and joyful guidance can. Margarita, it's wrong to refer to the SSPX as "our separated brethren." It's also wrong to say they're not in the world. This wild exaggeration could easily then be applied to the FSSP or any of us who refuse to attend the Novus Ordo. Yes, they need to be in communion with Rome at some point. But the Holy Father says they're in the Church but in an irregular status. That is not separated, like they're Protestant. They are separated in their thinking. Yes, separated brethren can refer to protestants, but it can also have a more broad sense in that they are still brothers in the Catholic faith, but separated from us by a choice. As far as saying that they are not in the world, I am most familiar with those SSPXers who live in St. Marys and they are purposely separated from the world. They have separated themselves by condemning those who are not like them. I am not going to go into the FSSP which has its own problems. But I will say that if you separate yourselves so completely from those in the world that it is difficult to influence the world. If you want me to name specifics from many of them living in such a small town together, to the tattle-telling if some woman decides that it is better to clean her gutters in pants, to the condemnation of so many of the ignorant in the OF. As far as refusing to attend the OF, I can understand that having had to attend a few crazy masses myself, but what I said was that it is a mortal sin to miss mass on Sunday and if that means that you have to go to a OF mass, then you go and you just do your homework and find the best one you can. Also, the OF cannot be condemned as the ORDINARY form of the mass prayed by the Church. It can be critiqued and avoided, but not condemned whole sale. Finally, I said nothing about them being outside of the Church, but rather that they have become separated, which I mean in a broader sense then you have taken it. What kool-aid? Are you referring to obedience to Peter? Or faithfulness to the Church of Christ which has been unified since the Apostles? Or do you mean the mercy and care of the Universal Church for the souls of every person on earth even the misguided? I'm sorry, but what kool-aid do you mean? Margarite, I didn't say that my parish was taken over by the OF. That didn't happen. Besides, it isn't my parish any longer. I said that it had essentially been reduced to a Novus Ordo parish where the traditional Latin Mass is offered. Suggest you learn what the Catholic Church is all about, since that Church that emerged from Vatican II is not it. That all I have to say. I have no desire to argue with a whippersnapper.